I think for the first time ever, my visit to Oldham's Lyceum Theatre this evening wasn't marred by inclement weather and I managed to arrive at the theatre dry. A very good start, which only got better once inside. The Lyceum Theatre is a little strange in that it occupies the basement of the old 1839-built Lyceum Building, and the small but intimate theatre itself is actually underneath the road, meaning that nowadays we can hear the rumble of passing Metrolink trams above. It is certainly not an ideal building or location for this company of talented creatives, but somehow this simply doesn't seem to phase them, as the standard of both things technical and acting always ensure that their company remains amongst the top ten amateur companies within Greater Manchester. The Lyceum chose to start their current season of plays with one of Willy Russell's better known comedies, One For The Road. Having been scarred for life by terrible schoolboy productions of both Our Day Out and Blood Brothers I have tried to avoid Russell's work whenever possible; so I came to One For The Road without having seen the play before and had no prior knowledge of what to expect. I was pleasantly surprised by the writing; sharp, sarcastic and extremely well-observed. And although written in the 1970s, the play's themes are just as relevant today, and will undoubtedly strike a chord with many middle-aged suburban couples. This situation comedy tells the story of Dennis Cain on his 40th birthday. His lives the quiet, modern life in a new housing estate surrounded by similar houses. His life has hit a crisis. He is married and has a young son, but his youth and years of adventure and freedom prior to his domestic and stagnant present are playing on his mind - his needs out! He is in the middle of what people sometimes call 'a mid-life crisis' and with bitter irony and sharp humour he tries his best to shake off the shackles that bind him. 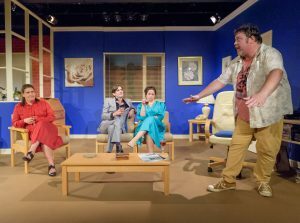 Comedic circumstances abound, especially with the arrival of neighbours Roger and Jane, and the play even has a couple of clever false endings before it finally does end on a rather more plaintive and sobering note than perhaps one would expect from a comedy of this genre. Directed by Melvin Bates, this play starts a little slowly but once the cast get into their stride it rattles along at a fair pace and delivers the humour and pathos with aplomb every time. The protagonist of the piece is Dennis Cain, played superbly by Damien Kavanagh. Kavanagh invested a great deal into this role and it paid dividends. His naturalistic easy-to-watch style gave realism and gravitas to the heightened comedic premises. Liz Travis plays his wife Pauline Cain with a certain acerbic quality. Outwardly prudish but inwardly yearning for more excitement, her actions and behaviours complementing Kavanagh's nicely. The neighbours, Roger and Jane Fuller, are surprisingly similar in their desires and habits, except here Roger, played with medallion-wearing sleazy charm and charisma by Martin Taylor is somewhat more henpecked than Dennis due to the rather sham-upper-class nature of the Sybil Fawtly-esque portrayal of Jane by Rachael Harrison. Harrison's well-judged change back to her old character towards the end was lovely to watch. My only real concern this evening was the accents. Russell is obviously Liverpool born and bred, but his plays do not need to be Liverpool specific. Manchester or anywhere in the north would have been just as good for this play, and I did think that the cast were struggling a little at times with their Liverpudlian. Complete with a mid-1980s bedecked living-room and kitchen on a postage-stamp sized stage (how do they do it? ), and some lovely topical references, including a rather good Terry Wogan impersonation, this is a lovely production and an excellent start to the Lyceum's season.